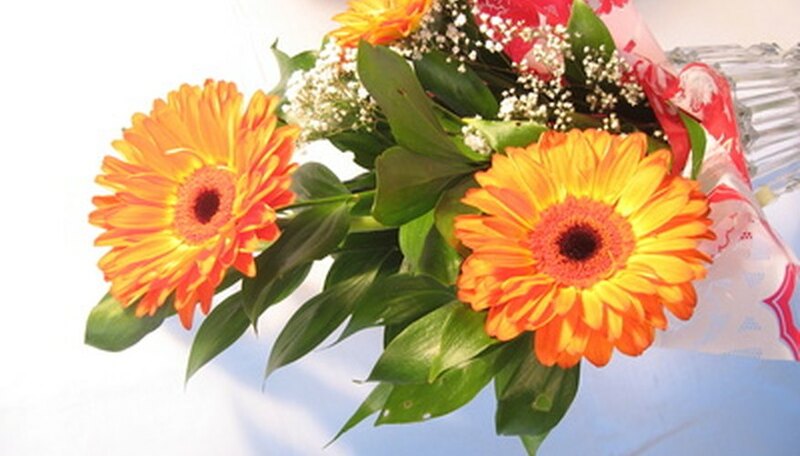 Cut flowers are blossoms that are separated from the plant and commonly used in flower bouquets. If you see arrangements that contain blooms that you are not familiar with, consider identifying these flowers. This way, you have the option to purchase the blossoms of your choice or even sow this variety in your garden to enhance your landscape. By making some key observations and using an Internet resource, identify the cut flowers that you desire. Write down the colors of the cut blossoms. Pay special attention to whether the flower is a single shade, such as the calendula, or if it displays various hues, like the kale. Make a note of the growth pattern of the flowers. Blossoms like the butterfly bush grow in a group on the vine, while others like the agrostemma grow by themselves. Record the leaf traits of the plant. Write down whether the veins of the foliage are a different shade then the rest of the plant and whether the texture is coarse or smooth. Note the petal characteristics of the blooms. Some flowers like the craspedia form into a ball-like shape, while others like the foxglove grow into tubes. Access the Association of Specialty Cut Flower Growers website to compare your findings to the database (see Resources). Click the "Flower Search" link and then click the various boxes, such as "A-B," on the page until you identify your cut flower. You also have the option to use the U.S. Department of Agriculture (USDA) site to name your blossom (see Resources). Click the "Advanced Search" link and use the menus to enter your flower information. Click the "Display Results" button on the bottom of the page to generate a list of possible matches. Consider taking pictures of the cut flowers to capture details that you may miss in your notes.